Adventures in the Endless Pursuit of Entertainment: BERNADETTE PETERS TO APPEAR AT FAO SCHWARZ IN NEW YORK CITY THIS SATURDAY AT 1 PM! 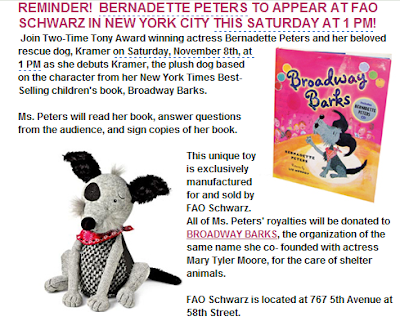 BERNADETTE PETERS TO APPEAR AT FAO SCHWARZ IN NEW YORK CITY THIS SATURDAY AT 1 PM! CAN'T JOIN US? ORDER PLUSH KRAMER TODAY - CLICK HERE! Order copies of Broadway Barks here.